In 1960 the US Army launched a design competition for a new aircraft which it certified as a Light Observation Helicopter (LOH). The specification called for four seats, a 181-kg (400-Ib) payload and cruising speed of around 193 km/h (120mph). 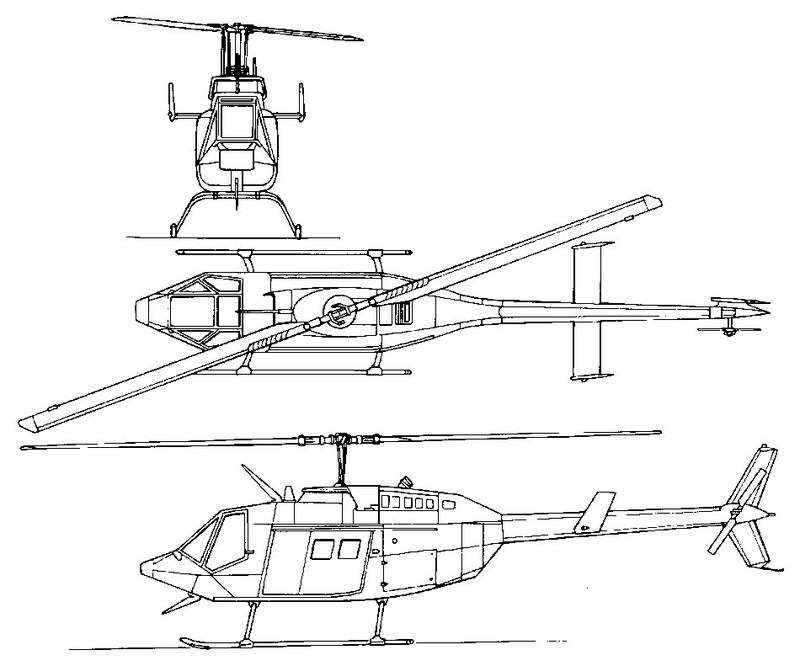 Design proposals were put forward by 12 US helicopter manufacturers from whom Bell, HilIer and Hughes were each contracted to build five prototypes for competitive evaluation. From the tests which followed, the Hughes HO-6 (later OH-6A) was selected for production as the US Army’s LOH. After losing the competition the company built a new prototype which it designated as the Model 206A JetRanger. This flew for the first time on 10 January 1966, and on 20 October 1966 this aircraft received FAA certification, after which it entered production for commercial customers, being built also by Agusta in Italy. The JetRanger was fundamentally the same as the OH-4A (formerly HO-4) prototypes, except for fuselage modifications to provide seating for five. It has been built in large numbers since 1966, and continues in production in 1989 in Canada under the designation Model 206B JetRanger III, having been the subject of progressive development and improvement programmes. The US Army had expected to procure some 4,000 examples of the OH-6A, but became somewhat disenchanted with Hughes when the unit cost began to climb rather steeply, and the production rate to fall off. As a result, the US Army’s LOH competition was reopened in 1967 and, on 8 March 1968, Bell’s Model 206A “as announced as the winner, with pro-duction under the designation OH-58 Kiowa starting without delay; some 2,200 of these aircraft were delivered by the end of 1973. The OH-58 differs from the commercial JetRanger by having a larger-diameter main rotor, with detail changes in internal layout and the provision of military avionics. Initial deliveries to the US Army began on 23 May 1969, and within less than four months the Kiowa was deployed operationally in Vietnam. Of the original 2,200 ordered for the US Army, 74 were withdrawn from the production line for delivery to Canada. The JetRanger was operated by the Canadian Armed Forces from December 1971 under the designation COH-58A, subsequently CH-136. An additional US Army contract for 74 aircraft was issued in January 1973 to replace those aircraft supplied to Canada. In the early months of 1971, Bell began delivery of an improved Model 206B JetRanger II, and this subsequently replaced the Model 206A in production. It differed by having the more powerful 298-kW (400-shp) Allison 250-C20 turboshaft engine, the installation of which involved only minor airframe modification, so that it was possible also to provide kits for the upgrading of Model 206As to Model 206B standard. 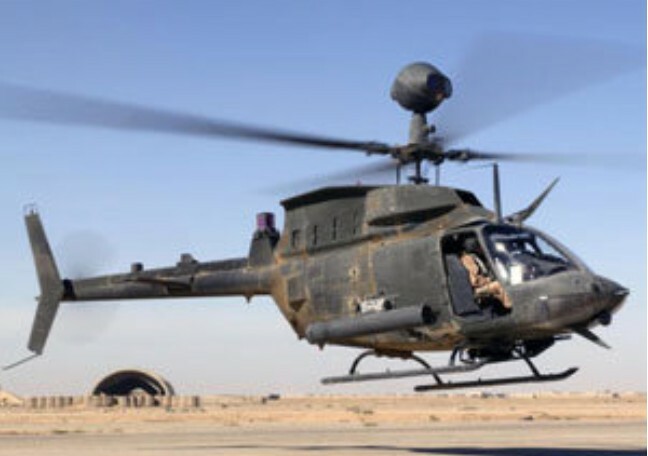 Australia acquired this version under the designation Model 206B-1 Kiowa, 12 being supplied by Bell and 44 produced under a co-production agreement. Com-monwealth Aircraft Corporation in Aus-tralia was responsible for final assembly and only the powerplant and avionics came from the United States. Under a US Army development contract, a single OH-58A was equipped with a more powerful 313-kW (420-shp) Allison T63-A-720 turboshaft engine and an im-proved flat glass canopy. This modified aircraft has the designation OH-58C, and subsequently two additional OH-58A to OH-58C conversions were carried out to allow more extensive flight testing by Bell and the US Army. As a re-sult of these tests, production modifica-tion of 275 OH-58As to a further-improved OH-58C configuration began in March 1978. Other versions include 12 OH-58Bs, similar to the OH-58A, supplied to the Austrian air force in 1976, and the US Navy has 40 TH-57A SeaRangers. These latter aircraft are dual-control trainers, which were ordered on 31 January 1968, to fulfil the requirement for a primary training helicopter for service with Naval Air Training Command at Pensacola, Florida. They are basically civil Model 206A JetRangers with US Navy avionics. The US Army Helicopter Improvement Programme (Ahip) involves the remanufacture of up to 578 OH-58A Kiowa scouts to OH-58D standard, incorporating 485kW Allison 250-C30R engines, an advanced composite four-blade main rotor, uprated transmission and tail rotor, a mast mounted sight and target designator, Stinger AAMs, CRT cockpit displays, and improved navigation and communications equipment. 23 were scheduled for delivery by the end of 1986, and conversions are being completed at a rate of five per month. Operationally, three OH-58Ds will lead five AH-64 Apaches, locating and designating targets for their Hellfire missiles. The OH-58D prototype flew in October 1983 and features a McDonnell Douglas/Northrop mastmounted sight and a Honeywell cockpit control and display sub-system. Up to 477 US Army Kiowas are planned for conversion to OH-58D standard. Powerplant is the 650 shp (485 kW) Allison 250-C30R turboshaft. Production of the JetRanger II ended in the summer of 1977, when it was replaced by the Model 206B JetRanger III. This introduced a more powerful version of the Allison turboshaft engine, offering further improvement in per-formance, and was the current produc-tion version in late 1981. This engine is also available as an installation kit to upgrade JetRanger Is to JetRanger III standard. The 1982 model JetRanger III included the C20J engine, in place of the C20B, an additional 14 gallon fuel tank capacity, bulge windows in the aft doors, and a lowered rear bench seat. The 206B-3 JetRanger III manufacture was transferred to Mirabel, Canada, in 1986, and also licence built in Italy by Agusta. The capability and reliability of the JetRanger family resulted in Bell de-veloping a medium-lift version under the designation Model 206L LongRanger. The JetRanger III has skid landing gear, high-mounted tailboom and horizontal stabiliser. Two-blade teetering main rotor with preconed and underblung bearings; blades retained by grip, pitch change bearing and torsion-tension strap assembly; two-blade tail rotor; main rotor rpm 374 to 394. Hydraulic fully powered cyclic and collective controls and foot-powered tail rotor control; tailplane with highly cambered inverted aerofoil section and stall strip produces appropriate nose-up and nose-down attitude during climb and descent; optional autostabiliser, autopilot and IFR systems. Of conventional light alloy structure with two floor beams and bonded honeycomb sandwich floor, the transmission is mounted on two beams and the deck joined to the floor by three fuselage frames. The main rotor blades have extruded aluminium D-section leading-edge with honeycomb core behind, covered by bonded skin; tail rotor blades have bonded skin without honeycomb core. The aluminium alloy tubular skids are bolted to extruded cross-tubes. Tubular steel skid on ventral fin protect the tail rotor in tail-down landing. Special high skid gear (0.25m greater ground clearance) available for use in areas with high brush. Pontoons or stowed floats, capable of in-flight inflation, available as optional kits. The Rolls-Royce 250-C20J turboshaft, rated at 313kW for T-O; 276kW max continuous. Optionally, one Rolls-Royce 250-C20R/4 rated at 336kW for T-O. Transmission rating 236kW for T-O; 201kW continuous. Rupture-resistant fuel tank below and behind rear passenger seat, usable capacity 344 litres. Refuelling point on starboard side of fuselage, aft of cabin. Oil capacity 5.68 litres. The JetRanger III seats two side by side in front and three-seat rear bench. Dual controls optional. Two forward-hinged doors on each side, made of formed aluminium alloy with transparent panels (bulged on rear pair). Baggage compartment aft of rear seats, capacity 113kg, with external door on port side. First announced on 25 September 1973, the Long Ranger was developed to meet a requirement for a turbine-powered general-purpose helicopter in a size and performance range between the five-seat Jet Ranger II and 15-seat Model 205A-1. This had the powerplant of the JetRanger III, and a fuselage lengthened by 0.63m (2ft 1in). With a capacity of 2.35cu.m, the LongRanger had good freight-carrying capability, and to simplify the loading of bulky items a double door was incorporated in the port side of the fuselage. Other improvements included the use of an advanced enlarged main rotor, plus introduction of the company's patented Noda-Matic suspension system which gives much lower cabin vibration levels. Re-design work included a new overhead struc-tural beam, new transmission, and altered fuel setup. The two-blade rotor system is basically the same as on the 206B, except that its di-ameter has been extended by four feet. This actually gives the LongRanger a very slightly lower disc loading than the 206B. Also, an extruded, integral blade spar in-corporating heavier elements at the tip and midsection replaces the older system by which weights were simply "tacked on" to the rotors for greater blade inertia. The original prototype Model 206L Long Ranger (N206L) flew for the first time on 11 September 1974 and production aircraft were delivered from October 1975. Accommodation provided for a pilot, co-pilot and five passengers. Alternative layouts allow for two stretchers and two ambulatory patients/attendants, or internal or external freight, or a four-seat executive seating arrangement. The LongRanger suffers by comparison in several areas, not the least of which are hovering ceilings in and out of ground effect. It gives up 4,700 feet in altitude to the 206B in HIGE and 3,800 feet in HOGE. With a capacity of 2.35cu.m (83cu.ft), the LongRanger clearly had good freight-carrying capability, and to simplify the loading of bulky items a double door was incorporated in the port side of the fuselage. Deliveries of production Long Rangers began in October 1975, but this was superseded by the Model 206L LongRanger II in mid-1978. The Model 206L-1 LongRanger II (certificated in May 1978) differs by having the more power-ful Allison 250C-28B turboshaft with a maximum continuous rating of 365kW (489 shp), a higher-rated transmission, and detail improvements. Detail improvements include a redesigned aft cabin to provide 0.05m more headroom for rear seat passengers, new cowlings, firewall, engine mountings and engine deck area structure and other refinements. The initial versions were 206L and 206L-1 LongRanger II, of which 790 built; limited production (17) of 206L-2; replaced by 206L-3 LongRanger III in 1982, of which 612 built, production having transferred to Canada in January 1987. The LongRanger IV was announced March 1992 as new current standard model; transmission uprated to absorb 365kW instead of 324kW from same engine; gross weight raised from 1,882kg to 2018kg; certified late 1992, delivered from December that year. In Chile, Industrias Cardoen Ltda developed the C206L-III multipurpose helicopter from Bell LongRanger, featuring pilot only in cockpit behind flat-plate glazing, plus cabin accommodation. On the prototype, which was the first helicopter to be built in Chile, the classic two-pilot cabin has been replaced by a single-seat flat-plate canopy nose section, and armament is carried under fuselage hardpoints. This prototype flew in mid-1989 and had logged 100 flying hours before being flown to Fort Worth to undergo FAA certification. The TwinRanger, twin-engined version, model 206LT was built on the LongRanger IV line between 1993 and 1997. Only 13 were built. The Gemini ST twin-engined rebuild of the LongRanger III/IV was developed by Tridair and Soloy in the USA. Over 1,700 LongRangers were produced by late 2002, including 275 LongRanger IVs and 206LTs. Customers included Air Logistics of New Iberia, Louisiana. which ordered 14 on 26 March 2003 for delivery between second quarter 2003 and 2005. Total of 12 delivered in 1999, 27 in 2000, 10 in 2001 and 12 in 2002. Subsequently, Bell initiated development of a multi-role military variant of the commercial LongRanger under the designation Model 206L TexasRanger. Capable of rapid in the field conversion to anti-tank configuration, the seven place helicopter is capable of packing number of jettisonable armament systems - four TOW missles, 14 x 2.75in rockets in dual pods, or 2 x 7.62mm mgs. The Model 406 is a derivative of the 206 using a new four-blade rotor, a conversion of OH-58As to provide the US Army with enhanced scout helicopters under the designation OH-58D. Featuring a mast-mounted sight, these have an Allison 250-C30R engine of 485kW (650 shp) rating. The Bell 406 Combat Scout is a derivative of the OH-58D. The first conversion flew on 6 October 1983, and Bell produced 578 of these helicopters on an initial contract through to 1992. The 406CS is identical to the OH-58D except for its systems integration and the multi-purpose weapon mounts that are fitted to the Combat Scout. The Bell 406CS featured a TOW missile system, 50 calibre machine guns and 70mm rocket launchers, and a "quick change" capability enabling a helicopter to be configured to meet a multitude of different roles on the battlefield. Tactical roles require a stable observation and weapons platform, highly manoeuvrable in a nap-of-the-earth environment. Supportive roles include search and rescue, medivac and logistic support. In its standard configuration the 406CS can accommodate two litter patients or 4 passengers. It can carry 680 kgs of sling load cargo. The Bell is powered by an Allison 250-C30 engine with an electronic supervisory fuel control unit. The combination of a high power to weight ratio with a new all composite tail rotor capable of 110 shp - 220 shp transient - permitted the 406CS to be flown sideways or rearwards in speeds of up to 30 knots with complete controlability. While sharing the same basic structure as the familiar JetRanger, the incorporation of advanced technology is evident from an inspection of the 406CS. Composite, on condition, components and structures are utilised, as are elastomeric bearings. The drive shaft is a Kalflex no-maintenance unit, features that background Bell's aim to establish a maintenance ratio of .3 hour for each hour of flight. Saudi Arabia was the first announced customer for the Model 406CS Combat Scout version of the US Army's AHIP OH-58D. Developed for the export market, the 406CS has simplified systems, a quick-change weapon system to carry four TOW 2 anti-armour missiles or combinations of Stinger AAMs, rockets and gun pods, while retaining engine/transmission of the OH58D. The 15 Saudi machines (MH-58Ds) will be fitted with roof-mounted SaabEmerson HELITOW sighting systems instead of the mast-mounted sight. There are some AH-58D Warrior armed examples. 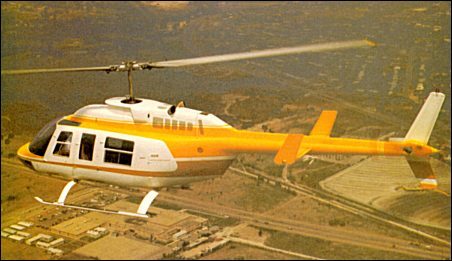 At the end of the 1970s, the US Army set up the Army Helicopter Improvement Program (AHIP) to provide a near-term scout helicopter (NTSH) as an interim aircraft pending development of a new design (in fact the LHX). After several proposals had been examined, Bell's Model 406 proposal was declared the winning contender in the AHIP competition and, on 21 September, 1981, the US Army announced that the Model 406 had been selected. A $151 million contract called for Bell to design, modify and test five prototype aircraft. The dynamic components were tested in March 1983 on the Model 206LM LongRanger c/n 45003 (N206N). The first of these five prototypes flew on 6 October, 1983, and was used for manual validation and training. The second and fifth prototypes were employed in flight testing at Bell's Flight Research Center in Arlington, while the third prototype was equipped with the mast mounted sight and sent to Yuma for mission equipment package evaluation. The fourth aircraft was used for avionics and electro-magnetic compatibility. The qualification programme was completed by June 1984 and operational tests were conducted at Yuma and Edwards in February 1985 and completed by March of the same year. The Model 406 / OH-58D incorporated a new power-plant, advanced avionics and systems as well as extended armament capabilities. Fitted with the new four-blade composite rotors developed by Bell and a mast-mounted sight, the powerplant was a 650shp Allison 250-C30R (T703-AD-700) turboshaft driving a four-blade soft-in-plane rotor, in place of the 420shp Allison T63-A-720 turboshaft driving the classic two-blade rotor of the OH-58C. The OH-58D, as it was officially designated, was equipped with a McDonnell Douglas/Northrop mast-mounted sight (MMS) capable of operating in day/night and limited visibility and with a Honeywell Sperry cockpit control and display subsystem. The MMS brings together a lot of sophisticated technology. It is a combination of television camera, thermal imaging sensor, boresight system and laser range finder/ designator. Automatically, the system focuses and tracks the area and points targets. This system provides commanders with a survivable real time combat information, command and control, reconnaissance, security, aerial observation and target acquisition/designation system to operate with attack helicopters, air-cavalry and field artillery units during day, night and reduced visibility. The MMS enhances survivability by allowing the crew to accomplish its mission while hovering behind trees and hilltops. By day, the MMS provides long-range target acquisition with television in a 2deg by 8deg field of view, and at night with thermal imaging in a 3deg by 10deg field of view. It also provides laser designation at stand-off ranges for Hellfire, M172 Copperhead and other Army and Air Force laser guided munitions (LGM). Armament of the OH-58D includes four FIM-92A Stinger air-to-air missiles, or four Hellfire air-to-surface missiles, or two rocket pods, or two 12.7mm machine-gun pods, mounted on outriggers on the cabin sides. Qualification tests for these armaments were conducted during November and December 1987. Under the AHIP programme, 578 were expected to be procured over the 1985-91 period at an estimated cost of $2.000 million. An initial batch of 171 OH-58Ds had been funded during FY88, in five lots (16, 44, 39, 36 and 36 aircraft). A further thirty-six aircraft have been requested in FY89. In 1987, deliveries totalled eighty-seven OH-58Ds among which several were of the armed version. Responding to the Army's desire to field an initial armed helicopter, Bell modified fifteen OH-58Ds to the attack configuration known as Kiowa Warrior or simply Warrior. By July 1987, sixty-four were on the US Army inventory and the first shipment to units stationed in Europe began on 11 June, 1987, when twelve OH-58Ds were loaded on board a single Lockheed C-5A Galaxy. Deliveries of the armed version began during the spring of 1988 to the 18th Airborne Corps Brigade at Fort Bragg. The Warriors were shipped to the Persian Gulf where they were stationed to protect the vital sea lanes for the world's oil supply. Because of the success of the Persian Gulf operation, the Secretary of the Army ordered that 243 OH-58Ds be reconfigured to the armed Warrior version. Eighty-one of these aircraft will also be equipped as the Multi-purpose Light Helicopter (MPLH), capable of carrying troops externally, litter patients or cargo on a sling. First operational deployment of the US Army OH-58Ds occurred during operation 'Desert Storm' when aircraft were deployed by the Aviation Battalion of the 101st Airborne Division and the 82nd Aviation Brigade of the 82nd Airborne Division. In May 1984 Bell developed the Model 406CS (Combat Scout). This increased the capability of the OH-58D and provided a quick change weapons package. Designed as a force multiplyer, the 406CS can accept any of the roof-mounted sights in production or under development, with growth provisions for laser target designation, FLIR and video thermal tracker. Bell is also under contract with the US Government for an all-composite airframe program (ACAP) which will lead to expanded use of composite materials for all Bell helicopters, including future scout helicopters. The power-plant fitted to the 406CS is the Allison 250-C30 turboshaft developing 650shp with built-in particle separation system fitted to a 510shp transmission with elastomeric vibration isolation, fail-safe four-point mounting and a thirty minute run dry capability. The first OH-58D(I) retrofit contract awarded was in January 1992. The first 117 conversions were at Amarillo, Texas, then onwards Fort Worth. The US Army initially planned to modify 592 OH-58A to OH-58D, reduced to 477; reduced again to 207, but Congressionally mandated re-orders increased the total to 398 (excluding five prototypes) by 1996 from new goal of 507. Taiwan ordered 12 OH-58Ds in February 1992, plus 14 options, subsequently converted to firm orders. Deliveries started in July 1993. The programme unit cost in 1993 was US$7.46 million. Production switched to the Kiowa Warrior from the 202nd aircraft and production was completed in 2000. The OH-58D features a four-blade Bell soft in plane rotor with carbon composites yoke, elastomeric bearings and composites blades. Transmission rating: Kiowa 339kW continuous; Kiowa Warrior 410kW continuous. Main rotor 395 rpm; tail rotor 2,381 rpm. McDonnell Douglas/Northrop mast-mounted sight containing TV and IR optics and laser designator/ranger; Honeywell integrated control of mission functions, navigation, communications, systems and maintenance functions based on large electronic primary displays for pilot and observer/gunner; hands-on cyclic and collective controls for all combat functions; airborne target handover system in all OH-58Ds operates air-to-air as well as air-to-ground using digital frequency-hopping; system indicates location and armament state of other helicopters; some OH-58Ds have real-time video downlink capable of relaying of US Army and Air Force aircraft to headquarters 40km away or, via satellite, to remote locations. Fully powered controls, including tail rotor, with four-way trim and trim release; Stability and Control Augmentation System (SCAS) using AHRS gyro signals; automatic bob-up and return to hover mode; Doppler blind hover guidance mode; co-pilot/observer's cyclic stick can be disconnected from controls and locked centrally. The basic OH-58 structure reinforced; armament cross-tube fixed above rear cabin floor; avionics occupy rear cabin area, baggage area and nose compartment. Powered by one Allison 250-C30R (T703-Ad-700) turboshaft, (C30R/3 with improved diffuser in Kiowa Warrior) with an intermediate power rating of 485kW at S/L, ISA, FADEC. Transmission rating: Kiowa 339kW continuous; Kiowa Warrior 410kW continuous. One self-sealing crash-resistant fuel cell, capacity 424 litres located aft of the cabin area. Refuelling point on starboard side of fuselage. Oil capacity 5.7 litres. ARMAMENT: Four Stinger air-to-air or Hellfire air-to-surface missiles, or two seven-round 70mm in rocket pods, or one 12.7mm machine gun, mounted on outriggers on cabin sides; port side only for gun. Saudi Arabia's have 15 Bell 406 Combat Scouts with roof-mounted sights. The stealth version of the Kiowa Warrior first flew on 6 August 1990 and the US Army's 1/17th Cavalry flies them with a laser-proof windscreen and more pointed nose. OH-58D (I) Kiowa Warrior: Armed version, to which all planned OH-58Ds are being modified; integrated weapons pylons, uprated transmission and engine, lateral CG limits increased, raised gross weight, EMV protection of avionics bays, localised strengthening, RWR, IR jammer, video recorder, SINCGARS radios, laser warning receiver and tilting vertical fin, armament same as Prime Chance, integrated avionics and lightened structure. “Prime Chance” is fifteen special armed OH-58Ds modified from September 1987 under Operation Prime Chance for use against Iranian high-speed boats in Gulf; delivery started after 98 days, in December 1987; firing clearance for Stinger, Hellfire, 0.50 in gun and seven-tube rocket pods completed in seven days. Further conversion for development trials. “MultiPurpose Light Helicopter” (MPLH) involved further modification of Kiowa Warrior; features include squatting landing gear, quick-folding rotor blades, horizontal stabiliser and tilting fin to allow helicopter to be transported in cargo aircraft and flown to cover 10 minutes after unloading from C-130. Later additions include cargo hook for up to 907kg (2,000 lb) slung load and fittings for external carriage of six outward-facing troop seats or two stretchers. All Kiowa Warriors have MPLH capability. OH-58X Light Utility Variant: Contender for anticipated US Army requirement; fourth development OH-58D (69-16322) modified in 1992 with partial stealth features (including chisel nose); concept subsequently discarded. In late 1989, overall production by Bell of members of the Model 206 family was considerably in excess of 7,000. Agusta, in Italy, has also produced JetRangers and LongRangers under licence from Bell, these being generally similar to their American counterparts. 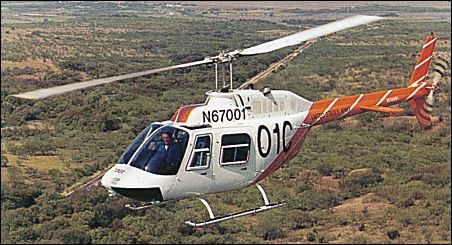 In 1993 the US Army took delivery of Bell 206B-3 training helicopters, designated TH-67 Creek (Bell designation TH-206), selected in March 1993 as the US Army NTH (New Training Helicopter) choice to replace UH-1 at pilot training school, Fort Rucker, Alabama (223 Aviation Regiment at Cairns AAF and 212 Aviation Regiment at Lowe AHP). Instructor and pupil sat in the front seats. The US Army initial NTH contract was for US$84.9 million. Powered by Rolls-Royce (formerly Allison) 250-C20JN engine, the first batch included nine cockpit procedures trainers outfitted by Frasca International; three configurations: VFR, IFR, and VFR with IFR provision. TH-67 features also include dual controls, crashworthy seats, five-point seat restraints, heavy-duty battery, particle separator, bleed air heater, heavy-duty skid shoes and enlarged instrument panel. IFR version additionally possesses force trim system, auxiliary electrical system and is FAA certified for dual pilot operation. The US Army initial order was for 102 in IFR configuration, and a second batch of 35 VFR helicopters were ordered February 1994. Deliveries began on 15 October 1993 with N67001 and N67014 (all TH-67s have civilian registrations). 45 aircraft (and six procedures trainer) were delivered in time for the first training course to open on 5 May 1994. Initial orders were for 137 TH-67s and nine cockpit procedures trainers; all delivered by late 1995. Additional orders were placed on behalf of the Taiwanese Army, which received 30 TH-67s in 1997-99. Deliveries in 1999 included six to the Bulgarian Air Force. A further 50 were ordered for US Army for delivery between September 2001 and November 2003. Over 7,750 JetRangers produced by Bell and licensees, including 4,400 Bell 206Bs and 2,200 military OH-58 series; and 900 in Italy. Bell Canada delivered 28 206Bs in 1999; 14 in both 2000 and 2001; and 20 in 2002 (including 10 TH-67s). Engine: Allison 250-C20B, 420 shp. Main rotor dia: 37 ft.